Worship at St. James’ is according to the Book of Common Prayer and the Anglican tradition. If you aren’t familiar with Episcopal worship, don’t worry: folks in the pews will help you in any way you need. Or, as many do, just let the flow of the service carry you along. The focus of our service is the Holy Eucharist, which we celebrate every week on Sunday mornings. We welcome all baptized Christians to the altar to join us in communion. 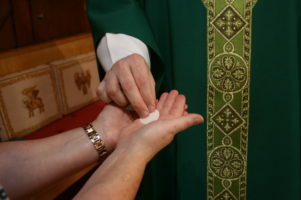 If you aren’t baptized, or don’t feel comfortable taking Communion, you may come forward with the congregation for a blessing. You can indicate this to the priest by just crossing your arms in front of your chest. During the service, we also read from Holy Scripture, hear a sermon, and pray with one another. Our worship hopes to nurture each aspect of the human mind, heart, and spirit where God is present. The different parts of our service are described below. Our worship begins with the “Liturgy of the Word” where we read from Scripture. Normally, we read from the Old Testament, from a New Testament Epistle, from one of the Psalms, and from the Gospel. That’s a lot of Scripture! We believe, though, that it is important to hear as much Scripture as possible, because the Bible directs us, guides us, challenges us, and leads us into a deeper relationship with God. 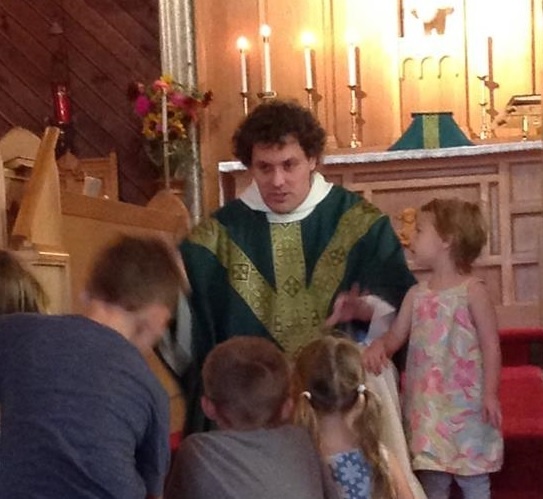 The sermon is an important part of each service. Here, our priest reflects on the readings we just heard and shows their application to our lives. The sermon is not a time to just sit back and listen; here we join the priest and reflect on the Word of God, searching our own lives to find where God has been present or where we may grow closer to God. Gathering on Sunday morning is not only for ourselves, but to be with other Christians in prayer and praise. During our service, we offer prayers for the Church, our nation and community, the welfare of the world, the departed, and the particular cares, worries, or joys of our parish. We keep an active prayer-list, and many parishioners take this home with them and pray with it throughout the week. The Holy Eucharist is the sacrament commanded by Christ for the continual remembrance of his life, death, and resurrection, until his coming again. Here, we meet Christ in a special way that feeds us spiritually and brings us closer to God. The Eucharistic prayer, and the taking of the Eucharist, is perhaps the most beautiful part of our liturgy, and it enriches us in many ways. This description only scratches the surface of our worship together. Like all good things, the liturgy is much, much more holy than can be described here on this web page. Please do consider coming to join us Sunday morning and worshiping God together!